Flex-metal® Additional Weight Kit includes 10 patented IRONWEAR® Flex-metal® weight inserts. These unique weights flex and move with you when you exercise. They are as soft as your own skin and act as padding to protect you in case of a fall. Flex-metal® weights are the most comfortable and safest weights available. Flex-metal® patented weight inserts are super flexible, thin and flat. All the edges are fully rounded, so there are no sharp or hard corners or bulges. Each individual weight insert has a fabric shell to allow it slide into the weight pockets. Flex-metal® patented weight inserts are much safer than any other weights and do not push into your body. Metal bars can be extremely dangerous if you fall and they move around during exercise. Metal bars also block your movement and can not be used comfortably for floor exercises. Shot and sand bags although less dangerous move around and bulge out causing localized high pressure areas which can chafe and bruise, and are also not suitable for floor exercises. Flex-metal® patented weight inserts are only ½ inch thick, 2 inches wide and 4 ½ inches long. 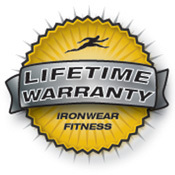 The inserts fit into the patented internal stretch pockets of many of IRONWEAR®’s products including the Uni-Vest™, Uni-Pants™, Under Vest™, Cool Vest™, Hand Irons™, Ankle Irons™, Shoe Irons™ and Iron Belt™. 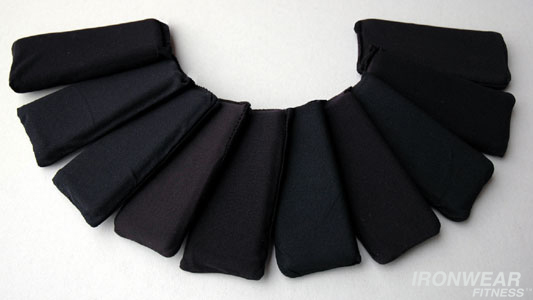 Most IRONWEAR® products are supplied with one weight per pocket, but the pockets have been specially designed to hold one or two weights securely. Flex-metal® Additional Weight Kits make it possible to double the weight of most IRONWEAR® products. Here is a chart which explains how many additional weights can be added to these IRONWEAR® products and how many kits may be used.